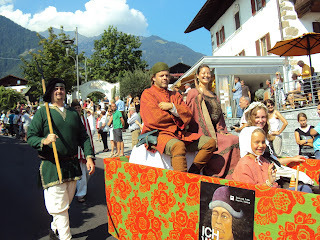 Last Sunday was the traditional Autumn Festival Parade in Dorf Tirol. 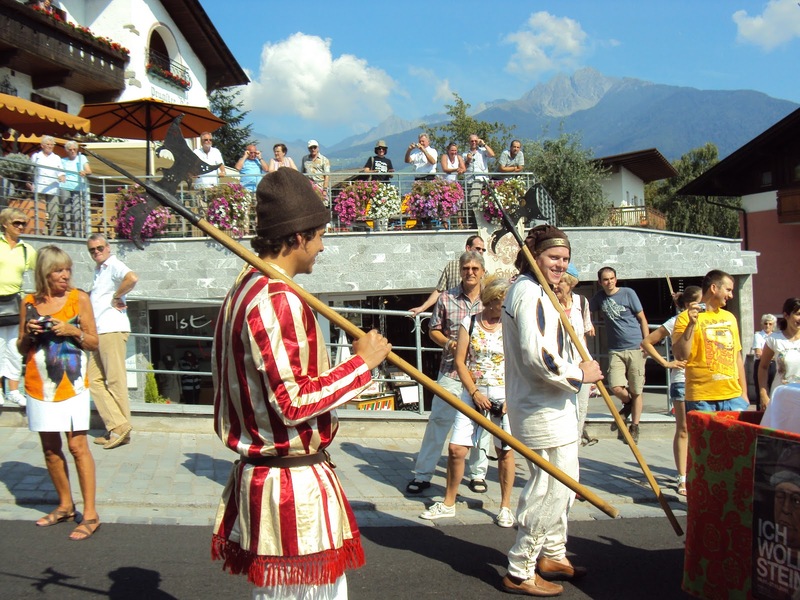 This parade celebrates the traditional products and activities of the area with a variety of floats and bands. Three of our students—Ryan Kelley, Chuck Solan, and Jin-Ju Pomeroy were asked to participate as part of the float for the current exhibit at Schloss Tirol. This exhibit is about the local poet Oswald von Wolkenstein, so Jin-Ju was the wife of Wolkenstein and Chuck and Ryan were guards. 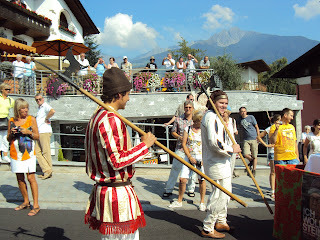 Those of us who weren't in the parade got to enjoy learning about Tirol while we watched. There were floats depicting breadmaking, hunting, and wool processing, as well as floats to showcase apples, grapes, and other local produce. And of course, lots of bands. I'm happy to see a blog from a B'burg group. My name is Colin Christopher, and I was part of the SA group in '92. If you haven't been yet, some of you should plan to hike up and spend a weekend at Oberkaser. I miss tea and talking with Mary, Brigitte's delicious food and lovely smile, and Sizzo's equally-delicious stories.